Horse ride food: on day rides, special diets, delicious camping food. In winter we usually provide a barbecue for one day horse rides and in summer a picnic. The food is fresh and good, but simple as it is based on what the arrieros, or cowboys, like to eat in the mountains. 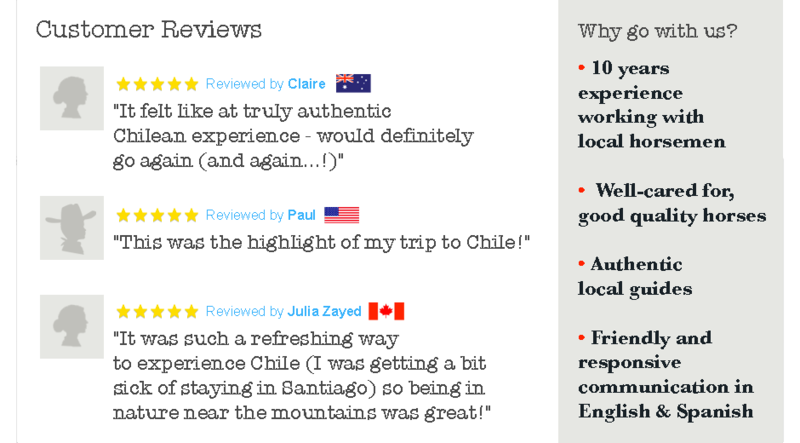 Chileans like good food so it is tasty, but authentic. We are happy to provide vegetarian food or special diets if you let us know in advance. On overnight camping rides we provide a picnic lunch, a good breakfast with usually eggs or porridge, avocado, fruit and toast and coffee. At night we make a fire and cook either a barbecue or something like cazuela ( Chilean national dish a bit like Irish stew) or soup and spaghetti. We provide beer and wine and, on camping rides, usually pisco sour. We provide water for day rides and for camping trips we boil water and leave it to cool overnight for your water bottles. We are happy to cater for most special diets and vegetarians on a horse ride if you give us details in advance. what do you have to eat to be a good olympic horse rider? I really do not know, but I put your comment into Google and the answer seems to be ‘watch what you eat’. No actual details, but diet important. That’s the best I can do – I hope it helps.